The band will be releasing their new album ‘Get Tragic’, which features ‘Mexican Dress’ on January 25 2019, and also have a set of launch shows in the UK and Europe in early 2019, including London Borderline on Sat 26th January. The story of ‘Get Tragic’ can be traced way back to the relentless gigging off the back of their 2014 self-produced and self-titled record, when the heels finally fell off of Blood Red Shoes at the end of that same year. A near-decade of incessant road time and a non-stop pace of life finally took its toll, with the band stopping only to quickly hammer out “another ten songs” to release as their next record, before ploughing straight back into touring. The pair exhausted themselves to the point of collapse. “We didn’t, at any point, have a breather,” says Steven Ansel (drums and vocals), “We probably didn’t see each other for about 10 days a year, tops, for six or seven years.” Understandably, such incessant close proximity led to implosion. “We got the to the end of the fourth record and were like, ‘F**k you, I never want to see you again’,”Steven adds, half-laughing, half-sighing. 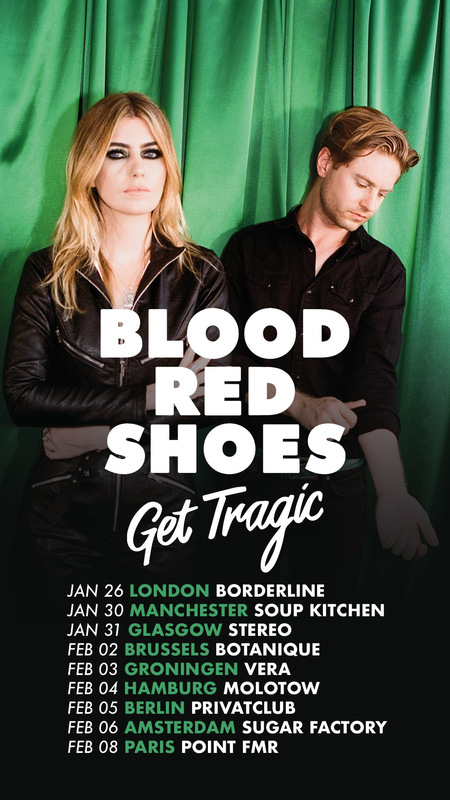 ‘Get Tragic’, then, fully embraces the absurdity of BLOOD RED SHOES situation. As a result, the pair come out the other side sounding fresher and more assured than ever. Recording in the States, working with a new producer, ditching the two-piece rock rulebook they arguably helped write – everything that went into Get Tragic was a leap into the unknown. Their first move, post-reconciliation was a writing retreat in rural Wales, which saw them woken up by the village community leaders, who entered the house while they were sleeping and banished them from town, fearful of the rock group’s proximity to the local church. Remarkably, though, Laura’s broken arm proved to be a blessing in plaster-clad disguise. Leaving her unable to play guitar, it prompted the longtime-guitarist to pick up a keyboard, and sing more than she ever had before. Through mishap and misfortune, the songs that came out of the sessions were the duo’s light at the end of the ever-expanding tunnel. They decamped to L.A. to record with Nick Launay (Yeah Yeah Yeahs / Arcade Fire / Nick Cave and the Bad Seeds). He pushed them to explore these new worlds even further, and as such the the after-effects of Laura’s motorbike tragedy can be heard throughout ‘Get Tragic’ – more melodic and synth-led than any of the band’s records to date, it embraces electronics and nuance in a way their stripped-back and stomping two-piece rock sound of old never could have. BLOOD RED SHOES you might think you know.